Magento Facebook Like Discount module will reward your customers with a discount for a Facebook like of any page you want to promote. Once the “Like” button is clicked - the customers will receive an automatic discount for their order. Discount for “like” offered in shopping cart increases customers loyalty. 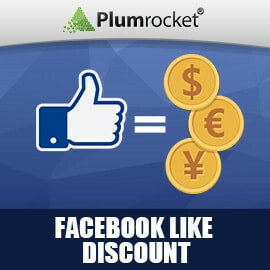 Facebook Like Discount extension is an easy yet valuable way for your customers to get a discount at your Magento store. Set up the Facebook application, indicate the intended Magento store page URL or Facebook page, and you're ready to earn more Facebook "likes". The Facebook discount extension serves multiple purposes - from increasing your Facebook Fan page Likes (or any page at all), making your customers benefit from precious savings, to bringing more attention to your business, thus increasing the website ratings.